Brazilian police have so far arrested four people in connection with a deadly fire that killed over 230 people at a nightclub in the town of Santa Maria in southern Brazil on Sunday. One of the owners of the Kiss nightclub, Elissandro Sphor, was put under arrest on Monday although he is currently being treated for smoke inhalation. On Tuesday, Grande do Sul state’s forensics department raised the number of fatalities from 231 to 234, to account for three additional victims whose names did not appear on the original list. The lead vocalist of the Gurizada Fandangueira band that launched a fireworks display shortly before the fire began was taken into custody while attending the funeral of another group member, accordionist Danilo Jaques. Police also detained the band’s security chief. Meanwhile, another owner of the nightclub, Mauro Hoffmann, handed himself in to police late on Monday for questioning. Police said that the arrests had been made for investigative purposes, with detentions having five-day limits. 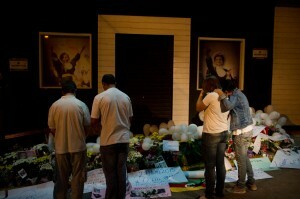 Brazilian Police are investigating whether security cameras recorded the events on the horrific night. “The video cameras weren’t in the nightclub (where they were supposed to be) and there was no computer with memory for storage,” prosecutor Veruska Agostine told reporters. Reports in local media say the club’s cash register is missing – this would have helped investigate whether the club was overcrowded. Over 100 people are being treated in local hospitals with 14 of them in a bad condition. Brazilian President Dilma Rousseff announced on Monday a three-day national mourning, while in Santa Maria 30 days of mourning were declared. The fire began on Sunday morning when the Gurizada Fandangueira band on stage of the Kiss club started a fireworks display. Thick smoke engulfed the venue after acoustic insulation caught fire. There were at least a thousand people inside the nightclub, most of them students of a local university, when the fire erupted. Panic intensified when security guards locked the exit. Media reports said the guards were unaware of the blaze and tried to stop people from leaving the building without paying.